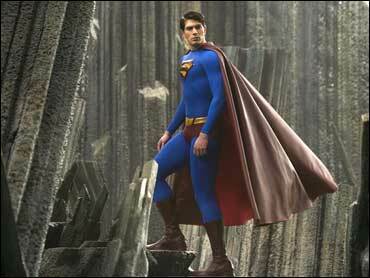 With that sturdy man-of-steel look about him, you'd think Brandon Routh was the next coming of Superman. Oh, wait, he is. Overnight, Routh went from yet another struggling actor in Hollywood to superhero of superheroes, landing the role of mild-mannered Clark Kent and his caped alter ego in "Superman Returns," due in theaters June 30. If the film succeeds, it will make his one of the most recognizable faces on the big screen, as it did another unknown - Christopher Reeve - when he premiered in the title role of "Superman" in 1978, the year before Routh was born. "If I really sat down and thought about all the possible implications, the good, amazing things it could mean, you could go a little crazy," Routh, 26, said in an interview at the recent theater-owners convention ShoWest, where he received an award as male star of tomorrow. "Because it's not only a film, it's an icon for many different things. Stability, strength and inspiration, all these things, as well as being the matinee icon. So every day, it sinks in more and more, and I try not to get ahead of myself and just move with the flow of things. It's bigger every day." At ShoWest, distributor Warner Bros. showed off a few minutes of "Superman Returns," which co-stars Kevin Spacey as villain Lex Luthor and Kate Bosworth as the love of Supe's life, Lois Lane. The idea of a new "Superman" flick had kicked around the studio for years. Routh entered the picture when he auditioned for director McG, who was set to make a version retelling the kid from Krypton's development from adopted farm boy to fighter for truth, justice and the American way. After McG departed, director Bryan Singer, who made the first two "X-Men" movies, came on board with a different twist. Singer's "Superman Returns" has our hero coming back to Earth after an absence of several years and resuming his dual roles as nerdy Clark and savior of the world. Lois has moved on with her romantic life, while Lex stumbles onto dangerous secrets about Superman's origins. 2"It's nice to watch the character mature, rather than just to start over again," Routh said. "He gets to continue his journey, which is exciting, I think, for fans, instead of retelling again what we've seen in many different versions. We really get to see what's next and watch him evolve as a human, well, as an alien, but on Earth, like we evolve. We get to watch Superman evolve and learn about relationships and love." Raised in Iowa - about 100 miles from where George Reeves, star of the 1950s television show "Adventures of Superman," grew up - Routh did school plays but initially gave no serious thought to an acting career. Planning to become a writer, Routh spent a year at the University of Iowa with the idea of modeling and acting on the side to pay for college. But those side gigs led to New York City and later Hollywood, where he landed a recurring TV role in the soap opera "One Life to Live" and guest spots on such series as "Will & Grace" and "The Gilmore Girls." Shortly before landing the role as Superman, though, Routh was tending bar to make ends meet. "Superman Returns" is not a sequel to the Christopher Reeve films, though Singer said the new movie does follow in their spirit and draws on design elements from the earlier franchise. To that end, it doesn't hurt that Routh bears more than a passing resemblance to Reeve. "Bryan says in some scenes, I'm the spitting image of Chris. Even my intonations of a line," Routh said. "But other times, it's completely different. It comes and goes, which is pretty exciting to me, to think of Chris and all the other Supermans in the past, that now there are things I'm adding to it."